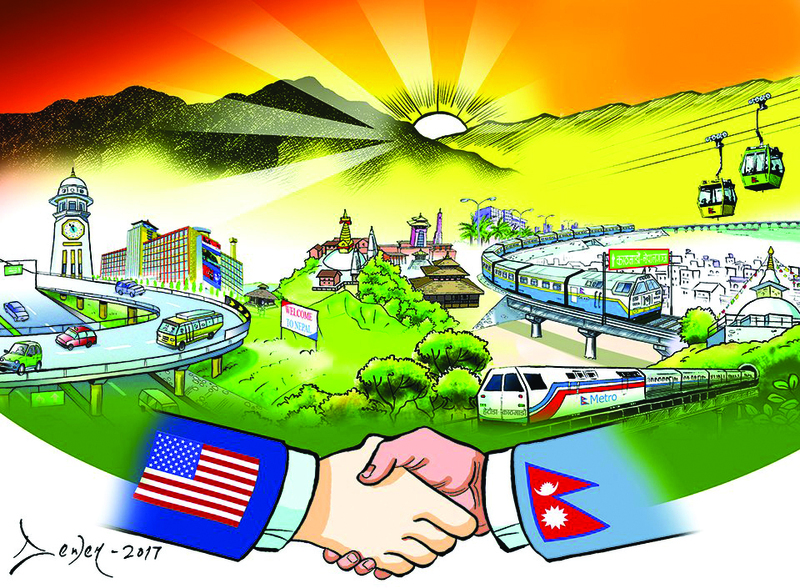 WASHINGTON, DC- As Nepal is seen as increasing its engagement with China (as China is rising spectacularly, Nepal’s relation with it and its relation with Nepal and other countries, it seems, is not going to be the same) on infrastructure connectivity and investment, it will have to watch not only how India is responding to Nepal’s engagement with China but also be mindful that United States is watching us as much. America is watching Nepal more keenly and closely now than in the past. That it may be doing so through New Delhi’s lens is another thing. So one major issue for Nepal’s Foreign Ministry mandarins, Foreign Minister and Prime Minister will be how to respond to America especially vis-à-vis Nepal’s relation with China. For China is a source of anxiety not only for India but also at the center of global power: America. One of the foreign policy dilemmas for Nepal, therefore, will be how to accommodate American concerns by taking China into confidence and how to accommodate China’s concerns without raising eyebrows in Washington. I draw this conclusion from formal and informal interactions I had with officials of State Department, Department of Commerce, members of think tanks and academicians during my recent trip there. Americans are carefully watching Nepal after Nepal signed an agreement on China’s 900 billion dollar project—Belt and Road Initiative (BRI)—in May, 2017. Nepal is soon expected to finalize projects under BRI that includes railway linking Chinese border town Kerung with Kathmandu, Pokhara and Lumbini. China has already conducted prefeasibility study on it. Nepali and Chinese officials are going to meet soon to discuss prospects and, most likely, to reach some agreement, including on financing modalities. Americans want Nepal not to be so close to China or “be very careful” while dealing with it. To prove their point, they invoke the case of debt trap of Sri Lanka. Be careful about the BRI debt trap, they warn. But implicitly they are saying democratic Nepal should cooperate more with democratic India and democratic America than with communist China. India is their best bet against China in Nepal and South Asia. President Trump’s Indo-Pacific Strategy, “largely a reaction to assertive China” according to one American scholar, has India at its core. Under this strategy, Trump administration has passed Better Utilization of Investments Leading to Development Act—or BUILD Act—in October, 2018, the law which allows it to channel more investment funds in Indo-Pacific region. The BUILD Act, as recognized by American think tanks, is “the US response to the challenge of China.” America thinks China is the major challenger to global economy. However, American assumption that Nepal should not get close to China ignores Nepal’s geo-strategic compulsions. China is an elephant in the room for Nepal, as much as it is for America and India. Nepal cannot ignore this reality. Admittedly, Nepal’s engagement with China became more visible after the 2015 blockade, during which Western powers were not even seen to be persuading—let alone pressuring—India to lift the embargo immediately. The blockade had once again exposed Nepal’s vulnerability and risks of absolute dependence on India for third country trade, but it also once again exposed that Western powers like the US—despite their generous aids in various sectors—do not speak for Nepal during the most difficult times. Turning to China became a compulsion for Nepal. China has found greater public approval in Nepal than even before. Political leaders may dither in or stall progress on BRI projects but there is a common consensus that Nepal needs to expand its trade and connectivity through the northern border points as well. That America under Donald Trump would take aggressive anti-China stand was obvious. He had made ‘China question’ the major part of his election campaign in 2017. He had promised that he would end America’s unequal trade relation with China. He has kept that promise with trade war now. But America is no monolith on China. While there are those who are convinced and want to convince us that China is undermining sovereignty and entrapping smaller countries into deep hole of debt, others think differently. Scholars at RAND’s Center for Asia Pacific Policy, for example, do not buy the debt trap argument. “Specter of debt trap is rubbish” one of them said, citing the example of Latin America where China has invested a lot but “it has not led to debt trap.” They argued that there has not been a comprehensive study on debt trap and said “it’s intellectually lazy to call BRI a debt trap diplomacy” without making holistic study on BRI. “Even America could join BRI bandwagon one day,” they said. But here is a catch. China is what it is today because it has not followed the Western prescription on governance and development. It is not likely to give up on its own model—whatever that may be—that has made it the formidable challenge to the West and a global superpower. Mainstream Western media seem to be coming to terms with this reality. There is an emerging voice, including from columnist Thomas Friedman, that the US should not stand in confrontation with China but instead China and America together should lead the global order of the 21st century. The ‘China Rules’ series in The New York Times offers insight on how China prospered despite adopting closed and authoritarian system and how Western ideas of liberal world order “failed to fail” China. Big question for Nepal will be how it will conduct its foreign policy if the US and China continue to go on confrontation mode? How will it balance American (together with that of India) expectation of becoming an active part of its Indo-Pacific Strategy and China’s expectation of becoming an active member of BRI? Prime Minister K P Sharma Oli has told the international community that “amity with all, enmity with none” is at the heart of Nepal’s foreign policy. That sounds impressive. But how will we apply this in practice if the world’s two major powers keep clashing for their influence in Nepal, and elsewhere?